In the spring of 1966, a Morningside Heights mother tacked a poster to a lamppost on Upper Broadway inviting other parents to help her start the kind of nursery school that she had sought in vain for her child: a diverse, non-sectarian, Montessori program serving the Columbia-Morningside community. Eighty families attended the founding meeting; seventy of them would drop out as it became clear what an enormous task it would be to start a brand-new school. 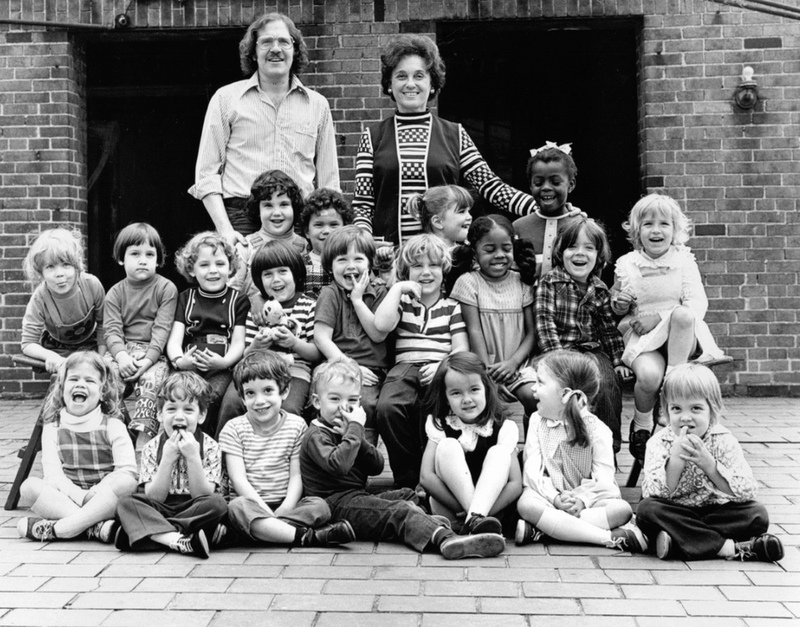 Thanks to the remaining hardy souls, Morningside Montessori opened in September 1966 with 19 students and one teacher. Our first home was the basement of a church at Amsterdam and 100th street. The school was ten blocks south of Morningside Heights, but the school had already been named and the name remained, despite the fact that we never left our “temporary” neighborhood to go back uptown. Whenever the congregation needed the classroom for a weeknight meeting (as well as every weekend), Morningside was required to clear the area completely. Huge, eight-foot-high foldaway cabinets were built to make the weekly disappearing act somewhat less arduous. One founding parent described the school as a sort of “Education Murphy Bed." In May 1967, the school moved to 327 West 101st Street, in a brownstone owned by a Morningside parent. In 1971, we moved again to our current location on 100th Street in Temple Ansche Chesed. But the history of Morningside is more than a series of address changes. In 1967, we joined the American Montessori Society. The school was originally conceived as a classic Montessori school, using only Montessori materials. Over time, we became an enhanced Montessori school, which meant that we studied current research about early child development, and recognized that if Dr. Montessori were alive today, she likely would have incorporated that knowledge into her work. We now include curriculum and materials that support and enhance not only the Montessori materials, but further expand upon the children’s experiences as learners. We began as a parent co-operative, which meant that the members directly owned and operated the school. In 1970, Morningside was legally incorporated, allowing parents to elect a board of trustees to take responsibility for the school’s business decisions, and the board in turn hires a director who is in charge of day-to-day educational matters. Today, Morningside Montessori School continues to thrive in our cozy space on the 6th Floor of Temple Ansche Chesed in our lovely Upper West Side community. We continually search for new ways to recognize and celebrate our diversity, and to continue providing an engaging and thoughtfully developed Montessori education.